The final night of the regular season on the Northern Kentucky high school gridiron was like most of the others this season, wet. Mother Nature was invited guest at many Senior Nights around the area as teams got in a final tune up before the KHSAA Commonwealth Gridiron Bowl kicks off next week. For the 25th straight time the Covington Catholic came out on the winning side of the ledger in a contest. The Campbell County Camels were the latest team to fall to CovCath as the Colonels shut them out 28-0. The Camels were outgained by a 396-61 margin in the contest. 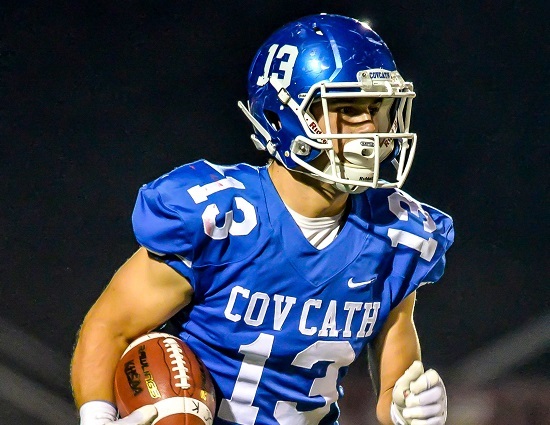 Casey McGinness had another big night as he tallied 185 yards and a touchdown on 31 carries and added a 37-yard reception. Caleb Jacob completed 8 of 13 passes for 192 yards, including a 16-yard TD strike to Michael Mayer. He also added a rushing TD. It what has become a Week 10 tradition small school rivals Beechwood and NewCath hooked up on Friday night and it was the Tigers that walked away as 33-21 road victors. It marked the fifth time in a row that Beechwood came out on top with the Thoroughbreds last winning in the series in 2013. Senior Logan Castleman led the way with 170 yards and three touchdowns on 26 carries. Castleman also had two fumble recoveries on defense. Wide receiver Gage Dollenmeyer and Luke Bolger each pulled in Cameron Hergott passes for touchdowns in the win. Senior Jackson Blank come up with a pair of key interceptions in the victory. The Scott Eagles were too much for the Lloyd Juggernauts as they prevailed 24-8 on a wet and nasty Friday night. It was the Eagles third straight win. Scott recovered fumbles on each of Lloyd’s first two possessions and parlayed both turnovers into touchdowns as they raced to an 18-0 first quarter lead. Quincy Perrin shouldered the load with 22 carries for 101 yards and a touchdown, his 16th rushing score of the year. He also converted the ensuing two-point conversion on a successful run. Junior defensive lineman Michael Nicholas came up with 2.5 sacks in the win.